By Agus in Toolkit. Updated on February 28, 2016 . Photoshop is a popular tool with designers and its extensions such as CSS3Ps and FontAwesomePS make it it a good tool for creating web design prototypes as well. Nonetheless, it wasn’t really created for this purpose and as current trends push forward with responsive design, CSS Pre-processors, CSS Frameworks, and resolution-independent graphics (SVG), Photoshop is becoming less relevant for web design. Not to worry though as there are plenty of alternative apps built by independent developers to help fill in the gaps. In this post we will take a look at these apps, and find out how far their features excel when compared to Photoshop for creating web design prototypes. 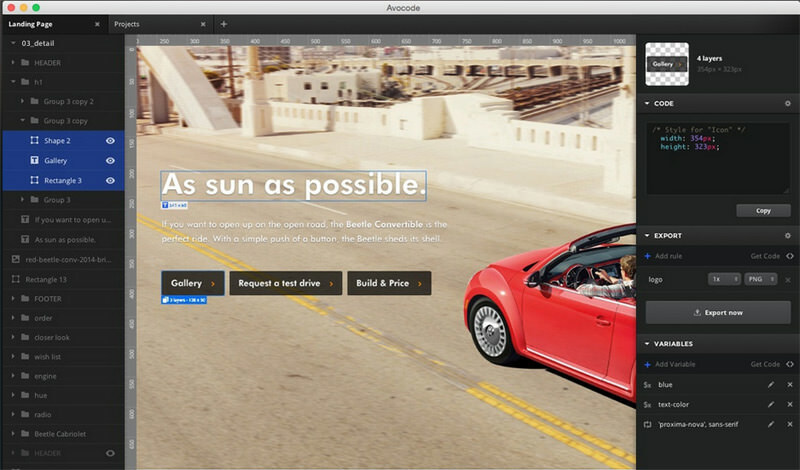 Webflow lets you design websites by drag-and-drop. Webflow creates the layout based on a Bootstrap grid so your website design is responsive-ready. Webflow also comes with a set of standard web components such as blocks, lists, and text formatting which you can add to the Webflow workspace. Styles can be easily added from a sidepanel and you can further adjust the properties of the elements as well. Once the design is complete, you can export the results of the design into code HTML and CSS. You also can share your work with a team. Avocode supports PSD files and allows you to immediately edit and transform it into a workable website with HTML and CSS. Avocode will extract all the assets in your project including the CSS, Images, and SVG (if any). You can easily extract CSS, in a form of Less, SASS or Stylus for any selected layer, as it has been integrated with CSSHat. Furthermore, Avocode is equipped with revision control which lets you revert to your previous designs, just in case anything goes wrong. Macaw lets you design web layouts and web elements aas if you are working on an image editor like Adobe Photoshop. You can create a columns or block areas, adjust their positioning, and set typography as required. 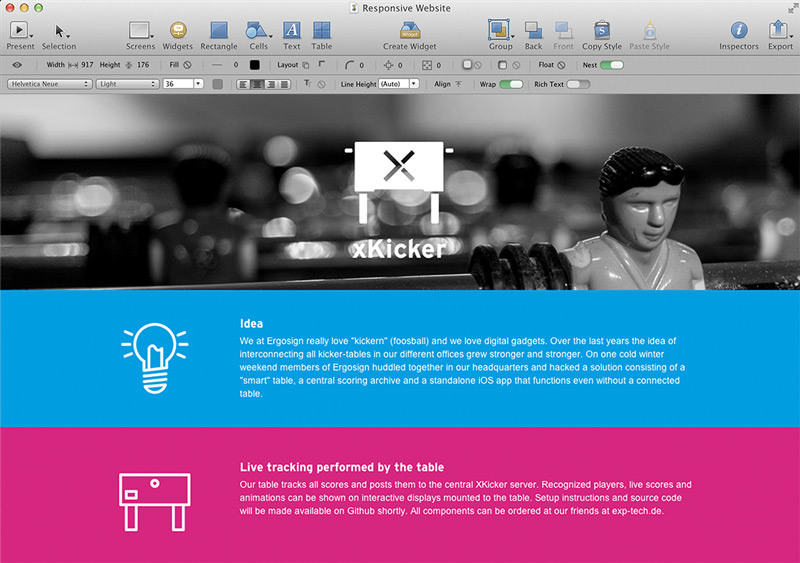 Macaw allows you to change the styles of multiple elements all in one place. You also can use the library to store all the elements for later use. To create a responsive design, Macaw lets you set breakpoints and optimize your site for all devices. 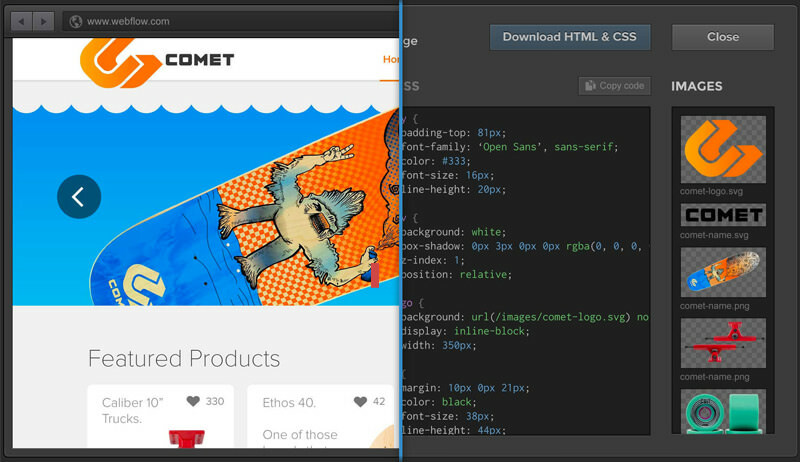 When the design process is completed, Macaw can generate proper HTML and CSS for you. 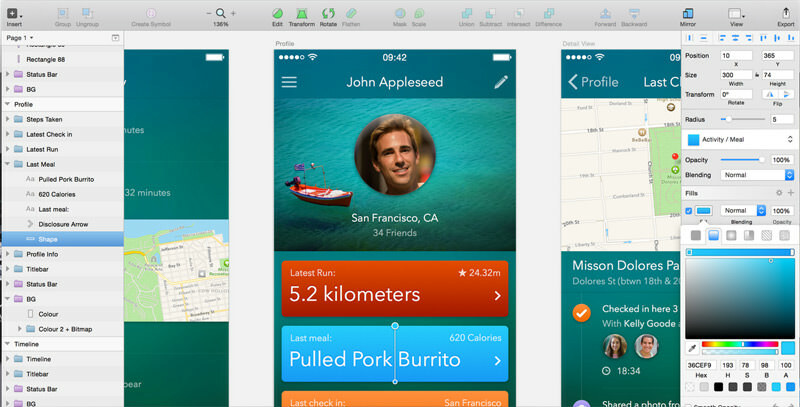 Sketch is ideal for designing interfaces and websites. It creates vector-based objects instead of in bitmap. Thus when you resize the canvas size, your design does not lose quality. Features like the ‘built-in grid’ will help you better arrange the object or a web layout placement. In addition, Sketch renders fonts similar to what is shown on Webkit (think Chrome, Opera, and Safari). So you do not have to worry about the results of the text in the image not being as sharp and accurate as the original text displayed on the browser. Sketch can also export the CSS for each element in the layer. Antetype is a vector-based application which is focused on visual design, great for creating interface elements such as gradient, drop shadow, inner shadow, text shadow, border style and rounded corners. Antetype also provides hundreds of widgets that you can use directly in your project. To create a responsive design, you can set breakpoints that will adjust the screen size. You can also export each element in the form of an Image or CSS.